The city of Benares (U.P.) from Amrit Rao's Ghat to the Munshi Ghat. 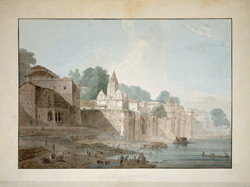 22 November 1789.
bl.uk > Online Gallery Home	> Online exhibitions	> Asia, Pacific and Africa Collections	> The city of Benares (U.P.) from Amrit Rao's Ghat to the Munshi Ghat. 22 November 1789. Varanasi is one of the seven sacred cities of the Hindus, the river banks are lined with continuous stone steps or ghats. Each of the hundred ghats has a lingam and occupies its own special place in the religious geography of the city. Early morning bathers occupy the ghats as do Brahmin priests offering puja and people practising meditation and yoga. Hindus regard the Ganges as amrita, the elixir of life, which brings purity to the living and salvation to the dead.